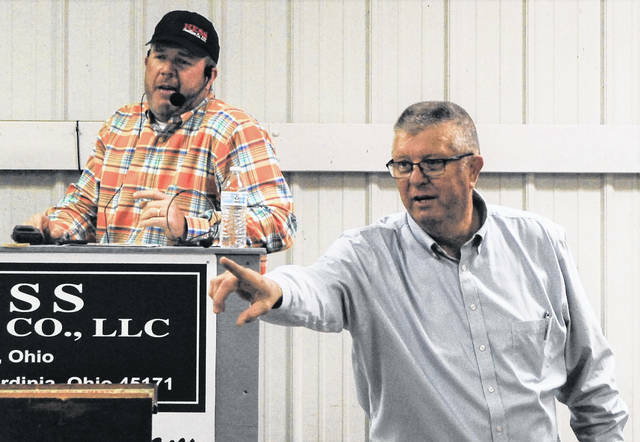 The father and son team of Brad, left, and Glenn Hess are hard at work during a recent auction at the Highland County Fairgrounds. Brad Hess has been calling auctions since 1991 while Glenn is now in his 52nd year of auctioneering. According to the Auction Masters website, the earliest auction on record took place around 500 B.C. Although Hess Auctions hasn’t been around quite that long, the father and son team of Glenn and Brad Hess are an integral part of the company’s 65th year of moving merchandise on the auction block. The history of the company, formerly known as Dannie Hess & Associates and now Hess Auction Co. LLC, dates back to 1954 when patriarch Dannie received his auctioneer’s license and began auctioning full time. The elder Hess went on the earn a real estate license in the early 1960s and his son Glenn told The Times-Gazette the secret to the long term success of the company has been consistency. Glenn said his father always wanted to be an auctioneer having grown up around livestock yards. After deciding to go to auction school, he served his apprenticeship and then launched his own company when Glenn was only 5 years old. That little boy is now in his 52nd year of auctioneering, following in his father’s footsteps in 1967, and then received his real estate license 10 years later. His son Brad has been in the auction business as far back as he can remember, clerking, doing set ups and carrying tickets before becoming an auctioneer in his own right in 1991. According to the Ohio Department of Agriculture, which regulates auctions, anyone who performs the function of an auctioneer or conducts an auction must be licensed, and in order to do so, a prospective auctioneer must first attend an approved auction school. After that there is a required one-year apprenticeship, then they also have to act as a bid caller in 12 auctions before applying for an auctioneer’s license, which involves taking and passing both a written and verbal examination. As is the case with most auctioneers, Brad pursued his real estate license as well, obtaining it in 1994 and in March 2016, was appointed by Governor John Kasich to serve as a member of the Ohio Auction Commission. Also on the Hess Auction team is Marshall’s John Grover, a 40-year veteran of auctions who joined the staff in 1986, and is a familiar face and voice to those that take livestock to Producers Livestock stockyards. In January 2008, Dannie Hess joined an elite group when he and only one other auctioneer were inducted that year into the Ohio Auctioneers Hall of Fame. Two years later passed away at the age of 81 following a long battle with heart and kidney issues. He said the technology has come a long way from the days of when his grandfather tacked up flyers on utility poles to today’s online and social media presence, and feels there is still a big demand for the live auction where a potential buyer can literally kick the tires on a tractor rather than just relying on an emailed picture. Auctions, like all businesses, have had to change to keep up with evolving technology over the years, but Glenn feels that the future of auctions is bright even though he sees some changes from years’ past. Hess Auctions LLC is associated with Donald E. Fender realtors for all of their real estate auctions and also sells real estate on private treaty.